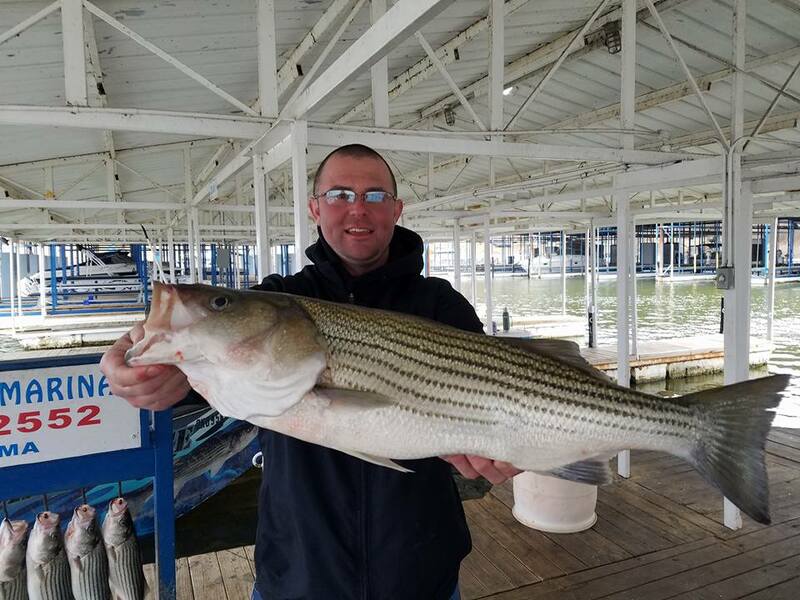 Aaron Sharp, owner of Sharp’s Striper Guide Service, lives on Lake Texoma and fishes year-round. 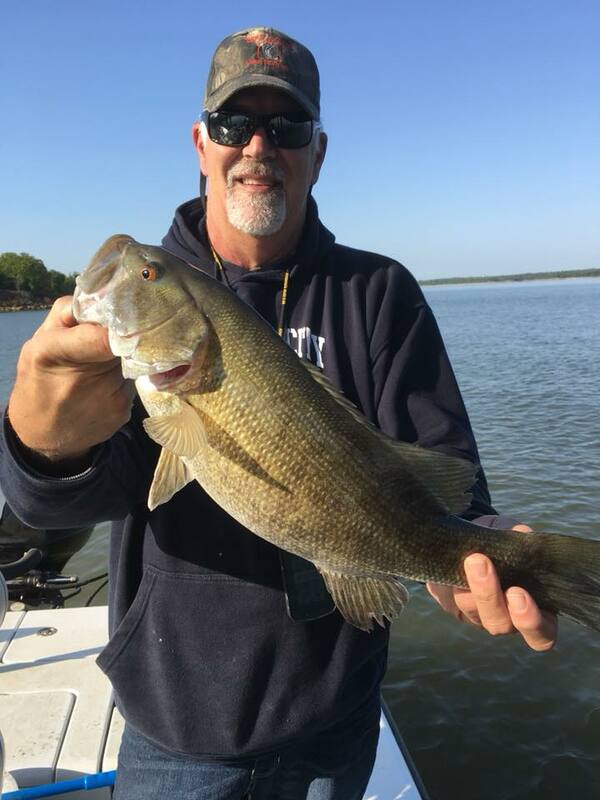 He offers guided trips on Lake Texoma out of Alberta Creek Resort and Marina for striper, smallmouth bass, and catfish and guides on the Red River for striper. Aaron is fully insured and licensed to fish in Oklahoma and Texas and guides out of a 27-foot Silver Dollar powered by a 250 horsepower Suzuki motor. Customer satisfaction is the number one goal. Sharp's Guide Service can accommodate any size group large or small. There is room for up to 6-8 people with storage for some personal items and larger group trips can be easily accommodated. Sharp’s Striper Guide Service guarantees that you will catch fish or your next trip is free! 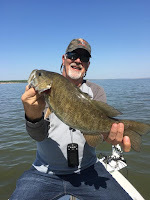 Lake Texoma Fishing Report - everything big is biting at Lake Texoma right now. Get out there and have some fun! Here are a few we caught in our secret spot. Lake Broken Bow - 4/10/18 - Thomas Guide Service reports the spotted bass bite as a "slugfest" with some largemouth bass mixed in. Lake Broken Bow - 3/29/18 - Bob's Guide Services reports the crappie bite is very good right now. Lake Broken Bow - 3/20/18 - Rudy's Guide Service reports excellent bass fishing right now for largemouth, spotted and smallmouth bass. Lake Eufaula - 4/14/18 - D & K Guide Service reports limits of crappie are being caught in deeper water after the recent cold front and high winds. 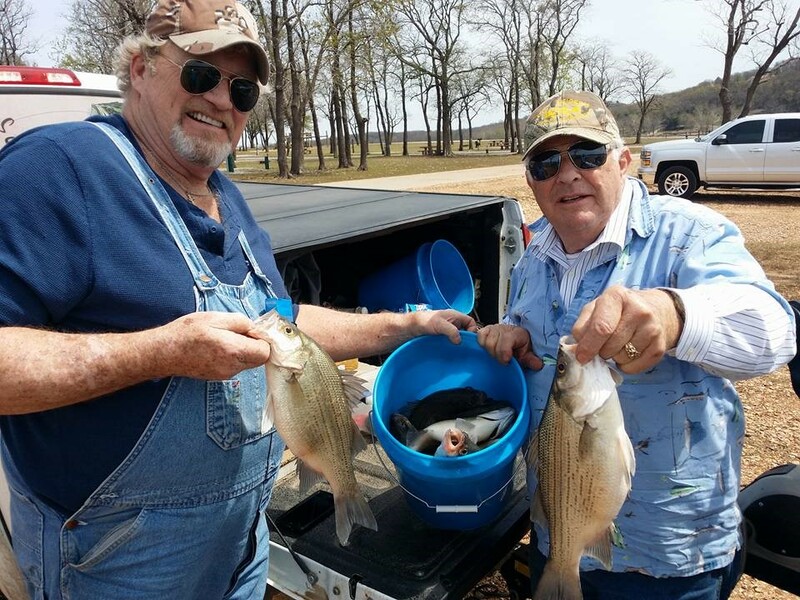 Lake Eufaula - 4/13/18 - Larry's Guide Service reports limits of crappie are being caught in deeper water in spite of the high winds and muddy water. 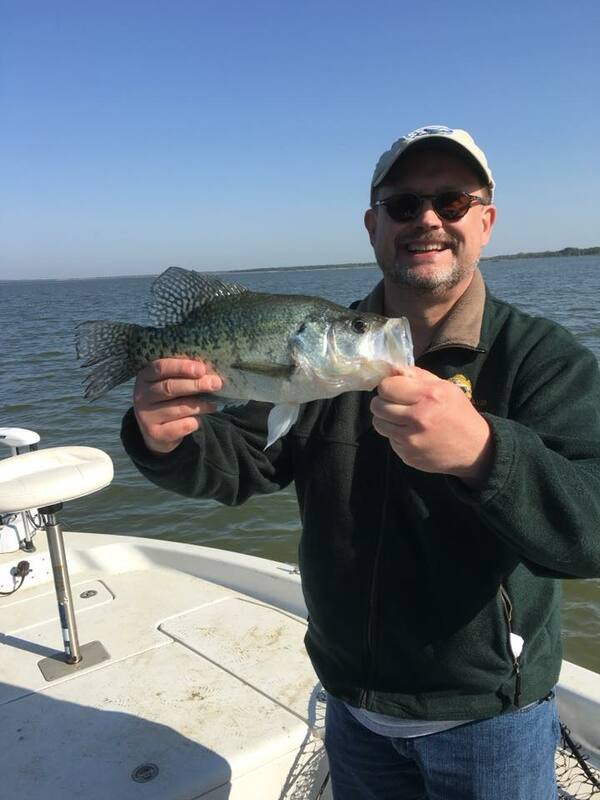 Lake Eufaula - 3/29/18 - Crappie Killer Dave reports limits of crappie are being caught right now. 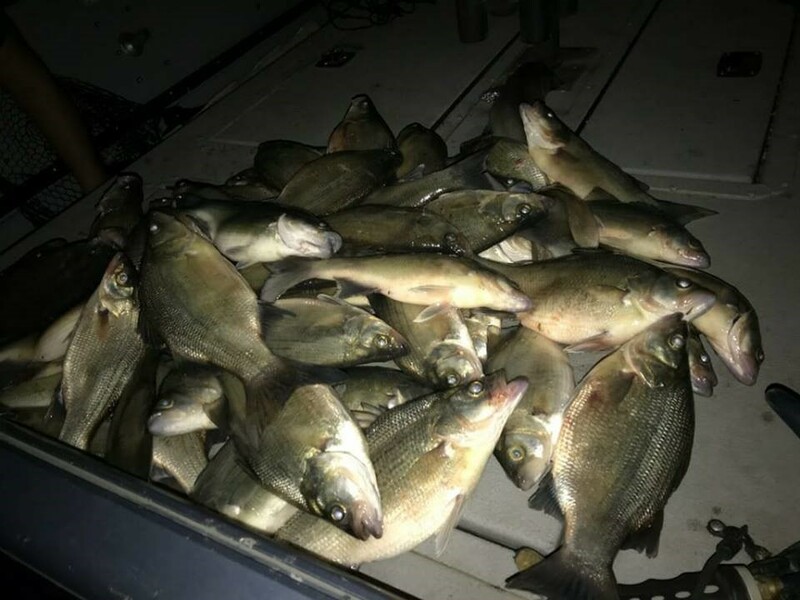 Illinois River - 4/11/18 - Thomas Guide Service reports the big, female sand bass bite is very strong right now. 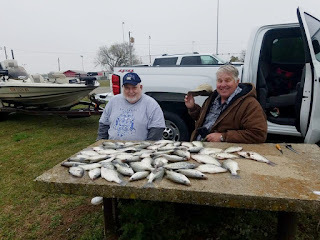 Lake Skiatook - 4/12/18 - Larry's Hook, Line & Sinker Guide Service reports the white bass are "pouring in over the side of the boat" and anticipates the hybrid bite to pick up soon. 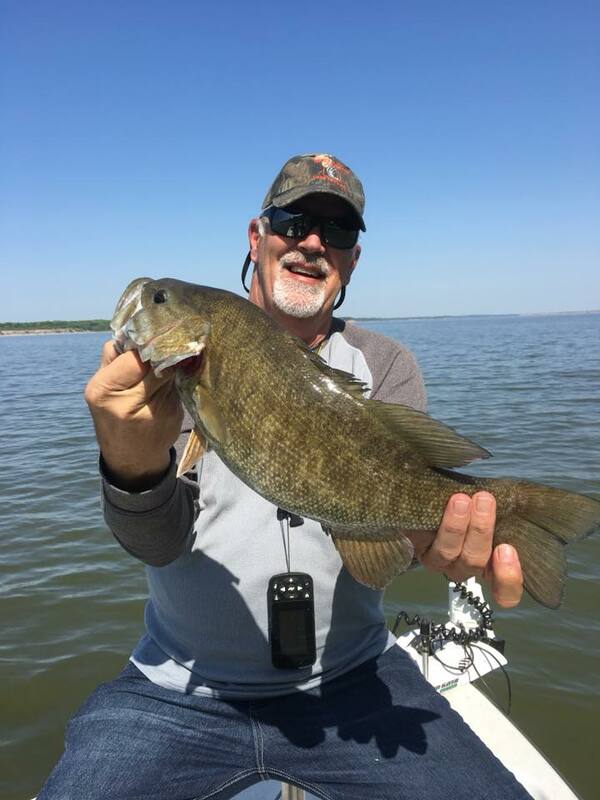 Lake Texoma - 4/10/18 - Trails Guide Service reports the smallmouth bass are on the beds and the fishing is "awesome". The Lake Watonga Trout Derby is a three-day event that gives fishermen an opportunity to catch tagged trout for prizes including a top prize of $500. One hundred tagged trout are put in the lake in conjunction with the normal trout stocking done by the Oklahoma Department of Wildlife Conservation. Wow! Todd Hoffman recently caught this 105.2 pound paddlefish on Grand Lake. If you would like to catch one too, check out Thomas Guide Service. 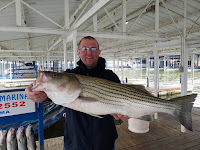 A new lake record was set at Lake Hefner for Striped Bass when Clidell Woody caught this 16.1 pounder on March 18th. The old record was 14.8 pounds set by Glen Burling in 2010. Clidell caught it on the west side of Hefner near the spillway. He was fishing for catfish using cut shad. Hybrids arrive in Lake Hefner via the North Canadian River from Canton Lake. Striped bass hybrids are a hatchery-raised cross between stripers and white bass and are favorites with fishermen because they are fierce fighters. 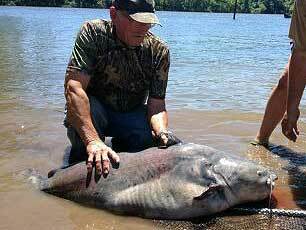 Earl D. Harless caught the new lake record blue catfish at Fort Gibson Lake on July 16. Jeremiah Mefford caught the new lake record crappie at Okmulgee Lake on August 3. Check out the new Rippertail Lures! ww.OklahomaFishingGuides.com is proud to announce our newest sponsor, Rippertail Lures, a family owned and operated business that was founded in 2007 by professional fishing guide Larry Vaughan. Unable to find a lure that combined durability with a high level of action, Larry decided to create a lure with a solid body and a corrugated, tapered tail. 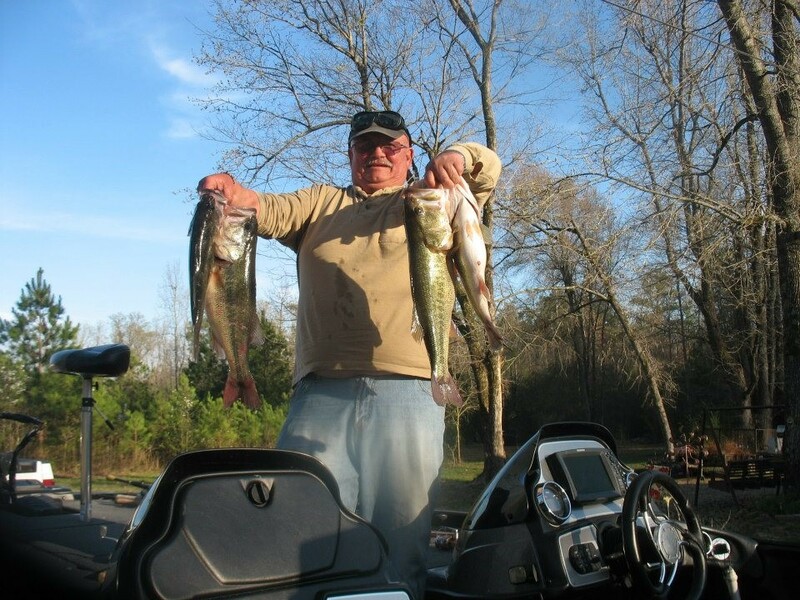 He started out by pouring these lures in his garage for personal use only, but after much success and numerous requests, Larry decided to make his lure available at Truman Lake Reservoir bait shops in Missouri in 2010. As the success and reputation of Rippertail Lures has grown, new and subtle improvements have been added that continue the lure's effectiveness. Rippertail's current selection is not only sleek and effective but tangle free too. Proudly manufactured in the USA, Rippertail Lures are constructed with the finest soft-plastics using the latest injection molding technology in the industry to provide the high quality fishing lures available in the US. Check out the entire line at www.RippertailLures.com. Online ordering is now available. The water temperature is 45 to 47 degrees depending on where you're at on the lake. The water clarity is clear on the South end, but mid lake is cloudy to stained . The upper end of the lake is muddy. Crappie fishing is currently slow. They are still in deep water 30 to 55 feet deep. They are positioning out on main lake points, main lake channels and bluff walls. They are staging to move up to spawning flats as soon as we get a warm spell which will start the spawn. This year I'm adding a Family Pontoon Guide trip to my fishing guide services. There's a 4 person minimum and we can take up to 8 people. It will be more comfortable and I won't have to hire another boat. We can all stay together for a family-oriented fishing trip! I have been working all winter setting out brush piles and my technique is different from others. 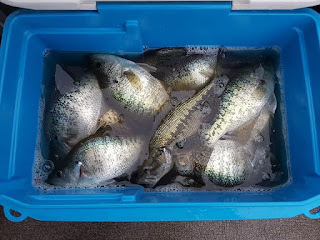 I have learned some tricks of my own over the years for making sure my brush holds lots of crappie. Come fishing with me and I will share my technique with you. Bass fishing has really been very good this year. I recently had a 12.39 lbs bass boated during a tournament along with four other fish that weighed 3 lbs each with a total of five fish weighing 24.34 lbs - good enough to finish in 1st Place in a Tri-Lakes Bass Tournament. 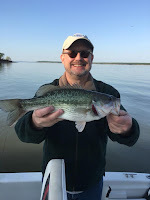 Good bass between 3 lbs to 4.5 lbs have been biting all winter long so come join me and you may catch the trophy of your dreams. Sand Bass season is near. In the next few day the weather will start to warm. When the water temperature reaches 50 to 52 degrees, the Sand Bass run will be on and will last for about 3 weeks. 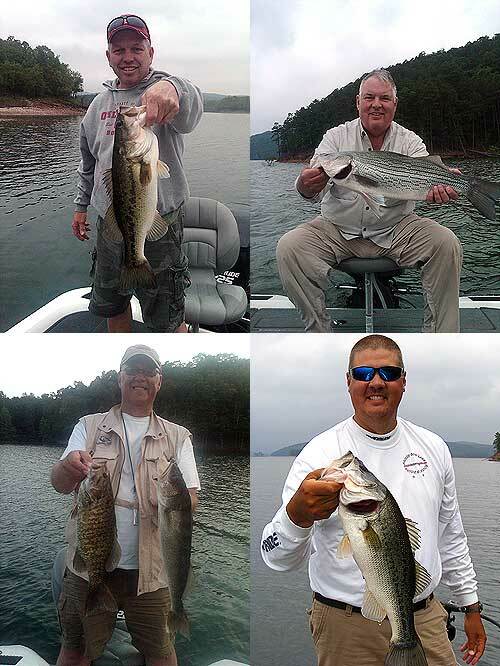 Lake Broken Bow has one of the best Sand Bass runs in the entire state. Male sand bass come in around a pound and females around 2 to 3 lbs. I will clean up to 20 sand bass for you. You need to bring an ice chest if you want to keep all the sand bass you catch. This is a great time of the year to introduce kids to fishing. Just bring lots of warm clothes. It is a long ride to where these fish are. Walleye is the best fresh water eating fish and beats crappie in opinion of most people. May through July are the best walleye fishing months on Broken Bow and we catch up to 50 walleye a day. Steve Branson recently caught this 25 inch rainbow trout on his fly-rod on the Lower Mountain Fork River located in Beaver's Bend State Park. 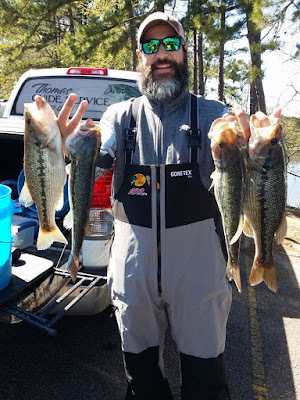 Check out the latest fishing action at Mountain Fork River, Lake Broken Bow and other lakes throughout Southeast Oklahoma here. I recently went fishing west of Tulsa and stayed at Bear's Glen Cabins on Lake Keystone. What a jewel of a property! Owned by the Schmidts for a number of years now, Sandra and her husband have been developing the property into a great getaway for Tulsans and Oklahomans alike. They have built, furnished and decorated all the cabins to feel as if it were your own cabin by the lake. They come furnished with full kitchens, linens, Cable TV, mini-blinds and air conditioning. 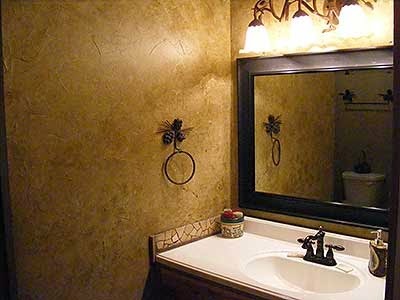 You will notice many special touches including faux-finished floors and wall treatments. Each cabin also has a covered patio area with seating, and picnic tables with grills and firepits. There's multiple hiking trails through the woods that lead down to the lake. There's a covered dock in a secluded cove that's great for fishing, swimming and parking your boat. For a great getaway -whether it be for a romantic weekend in the woods by the lake, or for a full water-filled fun weekend, check out Bear's Glen Cabins on Lake Keystone just west of Tulsa. For your next adventure, give Sandra a call at 918-855-5029 or 918-855-2484 or book your reservation online. 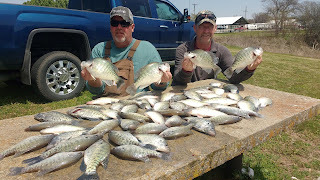 Big slab crappie are biting at Lake Eufaula this season! 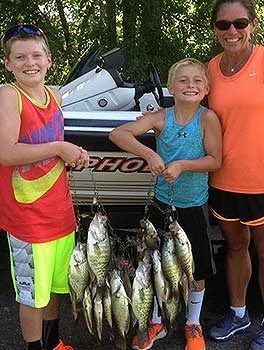 Dusty Keener of D and K Guide Service are reporting large numbers of large crappie this year. The fish pictured here were caught in what Dusty likes to call a pre stack area. The big girls spawn first the water temp was 52 degrees the fish were caught on minnows and jigs in 8 to 12 feet of water. These fish are set up to spawn when the temps warm up and that will start a whole cycle of fish catching opportunity with pre-spawn ,spawn, and post-spawn the whole cycle will run in two the month of June. You can find these pre stack areas just out from spawning grounds in a protected area from high winds and a flat area. 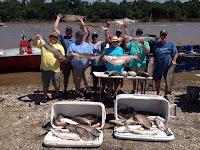 Call and book a trip with D & K Guide Service today at 918-470-7133 or 918-470-6422. They will put some trophy crappie in your hands! Oklahoma anglers can fish for free during Free Fishing Days June 1-2. During these days, a state fishing license will not be required for anglers. 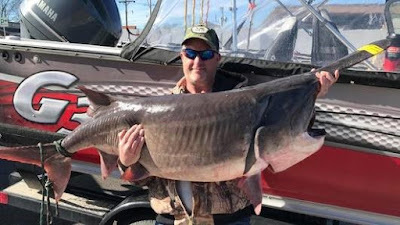 Oklahoma was the first state in the nation to offer free fishing days about 30 years ago and has since been followed by dozens of other states that have established similar days. For a listing of lakes and rivers along with fishing guides and cabins, check out Oklahoma Fishing Guides. While everybody is falling asleep in the deer stand, it's a great time to take advantage of cool weather and an excellent time to catch a huge crappie like the ones pictured here, caught just the other day on beautiful Lake Eufaula. 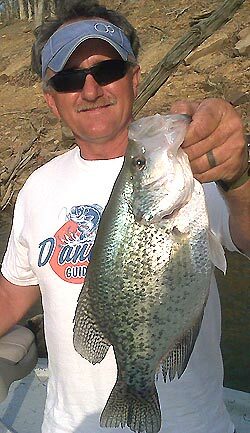 Every fall, crappie begin to gorge on shad to fatten up for the winter As a angler, take advantage of this seasonal pattern - the fish are biting! Another factor that always insurers a good bite is the significant decrease in lake traffic after the summer season. Less boating pressure on the fish and on you. And as the water temps begin to cool, slow your presentation down, matching the shad activity level. 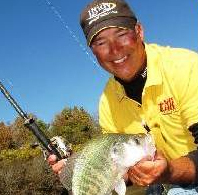 Using these three simple tips, you will catch plenty of crappie this fall. Now go have fun and enjoy yourself this fall and feel free to join us out on the water! As always we guarantee "No Fish, No Pay". On March 3, Royce Harlan of Kingston hauled in a 12.4-lb. 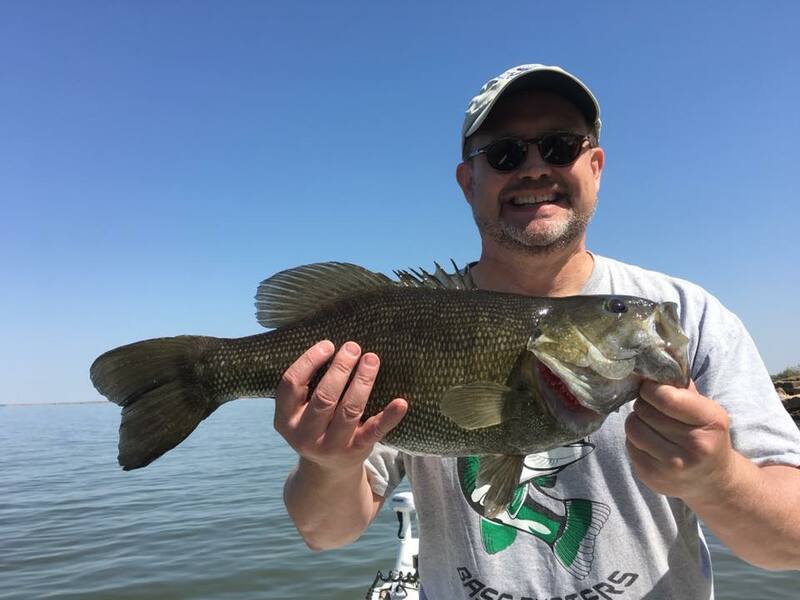 largemouth bass from the waters of Lake Texoma, nabbing that lake record spot and setting the stage for a great fishing season. Harlan caught the 24-inch bass in the Washita arm using a soft plastic bait. 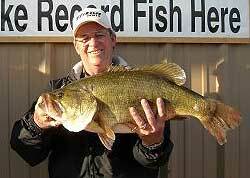 The fish is a new record bass for Texoma in the Oklahoma Department of Wildlife Conservation's lake record fish program. "It's always a thrill to catch a big fish," Harlan said. "Everybody always hopes for that one big bite. I got it, and I'm thankful for it." 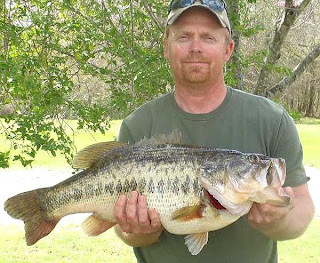 A new Oklahoma state record largemouth bass was caught Friday, March 23, at Cedar Lake in southeast Oklahoma. The fish weighed 14 lbs. 12.3 oz. 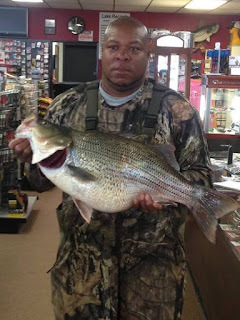 and was caught by Poteau angler Benny Williams, Jr. while on a camping trip at the 78-acre LeFlore Co. lake. Williams caught the bass at 11 a.m. on a ¼ oz. Striker King jig. This fish measured 26 inches in length and 22 3/8 inches in girth. Williams' fish breaks a state record held since 1999 when William Cross caught a 14-lb. 11.52-oz. bass from Broken Bow Lake. "Catching the state record largemouth bass in Oklahoma is a big deal and catching a fish this large is a big deal," said Barry Bolton, chief of fisheries for the Oklahoma Department of Wildlife Conservation. 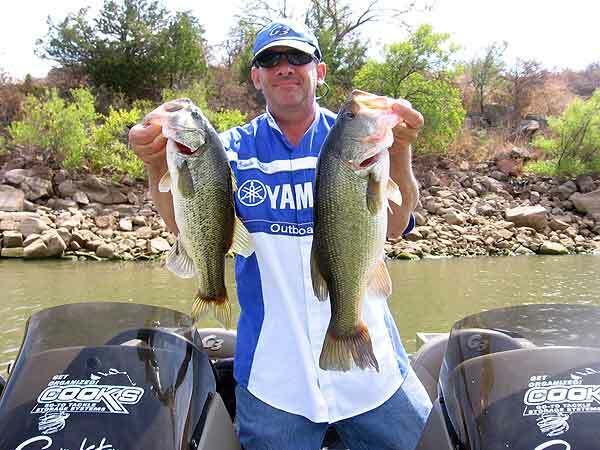 "It speaks to the quality of fishing we have in Oklahoma and also to the anglers who get out there and fish for them. We congratulate him on his great catch." According to Gene Gilliland, assistant chief of fisheries for the Wildlife Department, Cedar Lake has been known to produce big largemouth bass for anglers in recent years - not only because of its southeastern location, but also because it has a history of receiving Florida strain largemouth bass through the state's stocking program. "They grow pretty fast down in that part of the state," Gilliland said. "Cedar Lake has produced several double-digit fish in the last five years." Ryan Wasser of Pocasset was fishing March 31 at Lake Lawtonka in preparation for an upcoming local tournament when he hooked a fish that he knew was special. 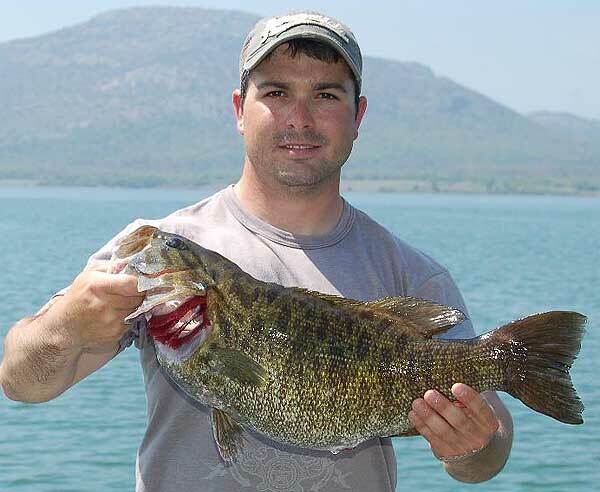 "The fish came to the top where I could see it, and I knew that I had a potential record type smallmouth on," he said. And a record smallmouth it was. At 8 lbs. 7 oz., the fish outweighs the previous record smallmouth by four ounces. Wasser caught the bass on a ¼ oz. shakyhead lure from Flatlands Custom Tackle rigged with a finesse worm and 10-lb. test line. He was using a Shimano reel on an Abu Garcia rod. The fish measured 23 1/8 inches in length and 18 inches in girth. The 13-16-inch slot length limit on large and smallmouth bass at Lake Elmer Thomas was deleted to help increase opportunity for anglers to harvest what is currently a surplus of fish. All the ponds on the Black Kettle National grasslands were added to the list of lakes with a 14-inch length limit on black bass. 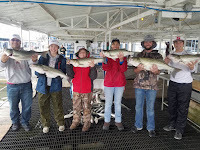 All Sooner Lake anglers must immediately release all striped bass under 20 inches in length to help manage the fishery for trophy striper fishing opportunities. 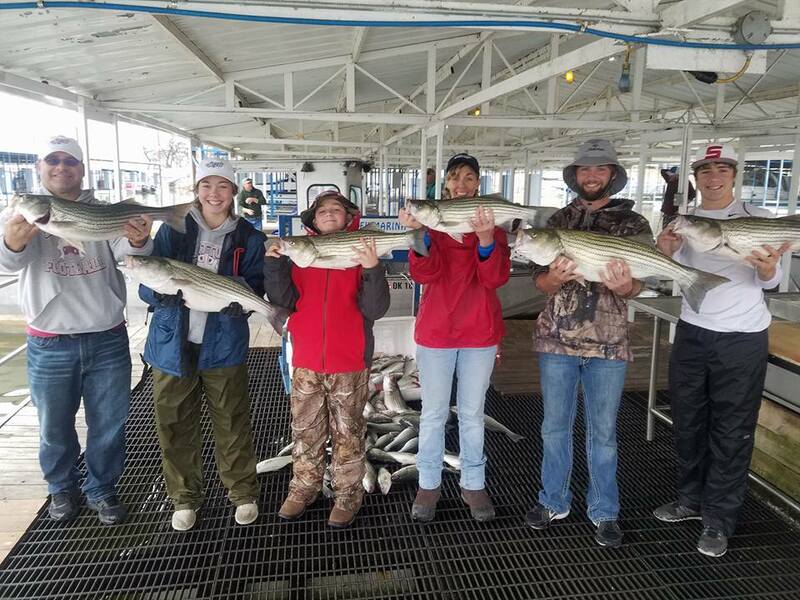 The daily limit on striped bass at five daily statewide except at Lake Texoma where limits would remain at 10 daily with no more than two measuring greater than 20 inches. Kaw Lake anglers can keep up to 20 striped bass hybrids and/or white bass combined, with no more than five over 20 inches in length. Wildlife enthusiasts may find just the right painting, sculpture, carving or other piece at the 2012 NatureWorks Art Show and Sale March 3-4 at the Renaissance Tulsa Hotel and Convention Center. NatureWorks is the Tulsa-based conservation group that hosts the art show, bringing together wildlife and nature artists from across the United States and abroad for the event. Art at the show will be for sale, which will help generate matching grants to assist with a variety of state wildlife conservation projects. NatureWorks has also partnered with the Wildlife Department on a number of different conservation projects, such as the Department's paddlefish management program, duck stamp print program and centennial duck stamp print. Additionally, NatureWorks has supported habitat work at the Harold Stuart Waterfowl Refuge Unit within the Deep Fork Wildlife Management Area (WMA) and the Grassy Slough WMA. NatureWorks also has been an important supporter of the Wildlife Department's Hunters Against Hunger program - in which hunters can donate their legally harvested deer to feed hungry Oklahomans. In addition, they have funded important projects to help schools and libraries in the state receive paid subscriptions to the Department's Outdoor Oklahoma magazine. Get all the show details here. 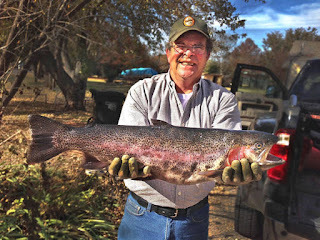 The Watonga Trout Derby will be held Friday March 2nd, Saturday, March 3rd & Sunday March 4th, 2012 at Roman Nose State Park and is being co-sponsored by Friends of Roman Nose State Park and the Watonga Chamber of Commerce. Pre-registration is available this year as well as online registration. The three-day event gives fishermen an opportunity to catch tagged trout for prizes. One hundred tagged trout are put in Lake Watonga in conjunction with the normal trout stocking done by the Oklahoma Department of Wildlife Conservation. A drawing from the tags of all registered trout will determine the $300.00 grand prize cash winner. 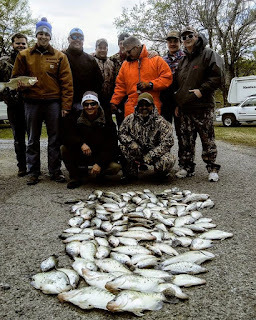 A $100.00 Sr. division and a $50.00 Jr. division prize will be given for the heaviest stringer of trout and will be awarded at the close of the derby. All tagged trout are worth cash or gifts. 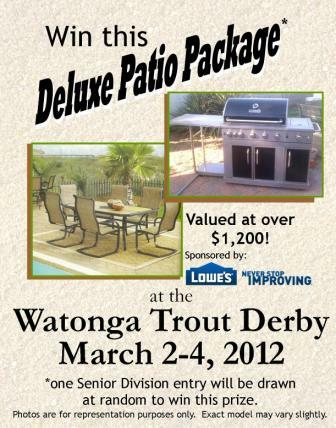 This year, one registration will be drawn to win a Deluxe Patio Package valued at over $1,200. This gift package is sponsored by Lowes. Cooler temps bring better fishing. Hello from Southwest Oklahoma and Lake Tom Steed. It has been a long time since I have been fishing and post a story. The cooler weather sure is nice and I simply couldn't just sit home anymore. 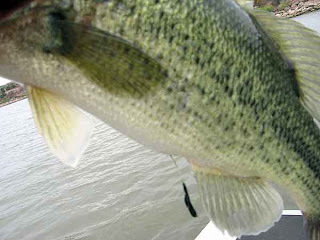 One of the bass I caught had fishing line hanging from it's rear, a first for me. The best thing to do for him was to trim the line short and let him go. The largest bass was caught buzzing a top water bait over one of several brush piles now extending from the water. For my next adventure I plan on getting a GoPro HD video camera and filming video of the bass in action at water level as well as all the other great sights you see while out on the water. I would like to dedicate this great day out to my fellow fishermen and friend Mike Jackson as well as my son Michael. You will forever be missed. As many of you know, I am a HUGE fan of Maniac Custom Lures. 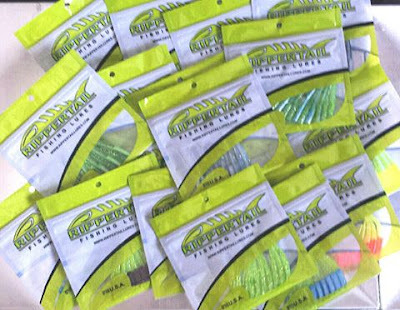 They make a superior product, right here in the USA, and the lures work great! In addition, Maniac Custom Lures sponsors our twice monthly free fishing lures giveaway. 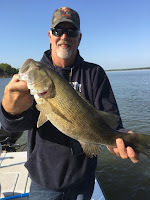 I have posted many big fish photos here on Hawg Blawg of the lunkers I have caught using Maniac Custom Lures from Texas to Canada. My favorite is the 4" Salt Stick fished wacky-rig when fishing for largemouth and smallmouth bass. I've also had a lot of success with the new 6" Maniac Minnow. During the summer months, Maniac is offer Free Shipping on all internet orders over $15.00. For free shipping on your orders this summer, enter the code SuMmeR2011. 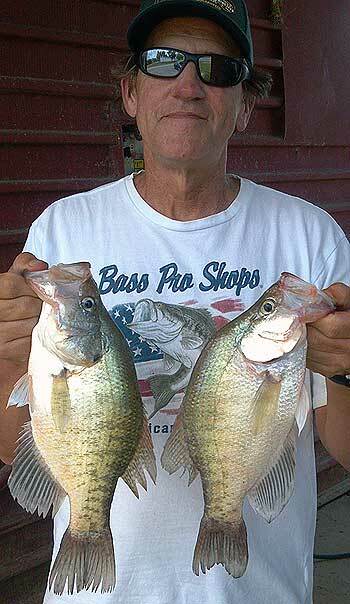 Please welcome our newest fishing guide, Barry Morrow of MRO Crappie Academy, fishing on Lake Eufaula! Barry fishes for trophy crappie, bass & catfish and offers a Kids Academy Certification Program. Barry is also a Lindey Tackle Pro Staff member who produces a weekly internet radio fishing report. Book your next fishing trip with Barry by calling him at 660-723-2667, 918-452-3511, or email him at bmorrow@barrymro.com. The fishing at Lake Broken Bow has been very good the spring, in spite of the crazy weather. This year's pattern is requiring different techniques than in the last several years, and clients are catching on quickly to what I like to call "Old School Broken Bow Fishing". Techniques that my Dad and I used years ago growing up on the lake are working very well for this year's tough bite. Here are some recent pictures from trips. Clients have caught just about every fish species in the lake. Pictured here are some nice smallmouth bass, largemouth bass, hybrid bass, and walleye. The spotted bass, sand bass, and crappie bites have all been strong too. Go fishing with Bryce Archey at beautiful Lake Broken Bow in southeast Oklahoma. Call him at 580-494-6447 or 870-582-4561. Visit his website here. Windy, windy, windy - that has been the story, if you get on a school of fish it`s very difficult to catch more than a couple before the wind makes it almost impossible to position your boat to really put them in the boat, though I.had two customers today that ended up with fourteen keeper sand bass. Fishing this morning, one of my clients caught this nice hybrid bass and forty sand bass, three walleye, and five crappie. Things are picking up when the wind allows you to get on the water! The fronts, both warm and cold as well as the high winds have made fishing very selective at best. I did manage to get out on the 28th of April and land one nice bass and a sharp looking 23" Saugeye. The water temps are still a bit coll but give it another week of warm weather and look out! bedded bass, hungry Hybrid and saucy Saugeye. It's hard to believe the water was this hard just a month and a half ago. The french word for crappie (SACALICE) or (White perch) are known all across North America for their delicious table fair. 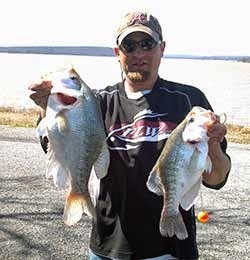 And Oklahoma has one of the top rated crappie lakes in the nation here at Lake Eufaula. 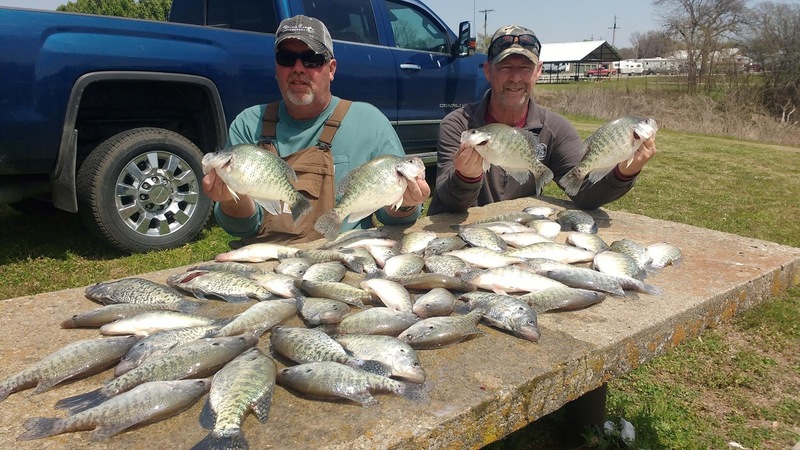 Listen, if you don't take advantage of this great opportunity to catch a nice mess of crappie , then you are just missing out on some of Lake Eufaula's best fishing action of the year. We notice when the water temperature reaches 65 degrees, the crappie start moving to the shore to spawn. We rig a 10 ft. pole with 6 ft of line. tie a 1/8 ounce black and pink jig on the end - and that's all you need! Some call this style of fishing doodlesocking, where you just wade along the bank and dip your bait close to a stump, log, rock or any thing that might cast some shade or hold fish. Some prefer a slip cork which can also be a very effective method of pulling in some nice crappie during the spawn. Set your stopper at about one foot, pitch it down the bank and give it a short pull. Let it sit and repeat. Keep in mind that while crappie is on their nests, they won't feed. The bite you feel is a result of a fish defending it's nest. 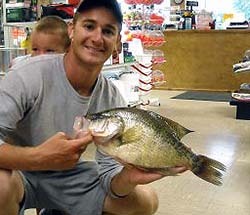 If you start catching bass on the bank, you know the crappie spawn is almost over. Not all crappie spawn at the same time. This process can last several weeks depending on the weather and water temperature. Now is a great time to introduce a friend to fishing. Spawning crappie make for some very exciting fishing action. Keep your hooks sharp and respect mother nature! The 13th Annual Prairie Trout Club Trout Derby is at Lake Pawhuska on February 19th from 8 a.m. - 4 p.m.
Cash and prizes for heaviest fish and heaviest stringer, youth and senior divisions. Pre-registration is $25, $35 day of event. For more information contact Pawhuska Chamber of Commerce at (918) 287-1208. The Watonga Trout Derby will be held Friday March 4th, Saturday, March 5th & Sunday March 6th, 2011 at Roman Nose State Park and is being co-sponsored this year by the Friends of Roman Nose State Park and the Watonga Chamber of Commerce. Pre-registration will be available this year in person at the Watonga Chamber of Commerce or online at www.watongachamber.com. Contact the Watonga Chamber of Commerce office at 580-623-5452 for details. Registration at the event will begin at 7:00 a.m. each morning and continue through 5 p.m. Friday and Saturday, and 1 p.m. Sunday. All fish must be weighed in by 3 p.m. Sunday, which will mark the end of the derby. The three-day event gives fishermen an opportunity to catch tagged trout for prizes. One hundred tagged trout are put in the lake in conjunction with the normal trout stocking done by the Oklahoma Department of Wildlife Conservation. A drawing from the tags of all registered trout will determine the $300.00 grand prize cash winner. A $100.00 Sr. division and a $50.00 Jr. division prize will be given daily for the heaviest trout in each category. Also, a $100.00 Sr. division and a $50.00 Jr. division prize will be given for the heaviest stringer of trout and will be awarded at the close of the derby. All tagged trout are worth cash or gifts. An exciting feature of this year’s Trout Derby is the guaranteed boat give-away. One registration will be drawn to win a Bass Brat Boat equipped with an aerated live well/ice chest, depth finder and troll motor. You must be at least 18 years of age & a registered participant of the 2011 Trout Derby to be eligible to win the boat. 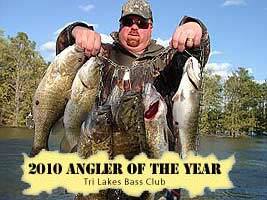 $100.00 in prize money each day for the largest trout caught in the Sr. Div. $50.00 in prize money each day for the largest trout caught in the Jr. Div. The heaviest single or stringer of trout do not have to be tagged, but only trout are eligible. Fishing licenses are available at ALCO Discount Store, Hwy 8, Watonga or The Bait Shop, 217 E Russworm Dr., Watonga. All fishing must comply with Oklahoma State fishing laws. The trout come from Crystal Lake Fisheries, Ava, Missouri. The successful participation of the public, the Oklahoma Department of Wildlife trout stocking program at Lake Watonga, the Watonga Chamber of Commerce and the Friends of Roman Nose State Park, gives the sportsman added incentive for trout fishing. Roman Nose State Park is located 7 miles north of Watonga on Hwy 8A. Registration headquarters is located at the General Store on the lake. Cost of entering is $20.00 for Sr. Div. and $10.00 for Jr. Div. for three days. For more information call the Watonga Chamber of Commerce at 580-623-5452, fax 580-623-5428, visit www.watongachamber.com or email cwatonga@pldi.net. 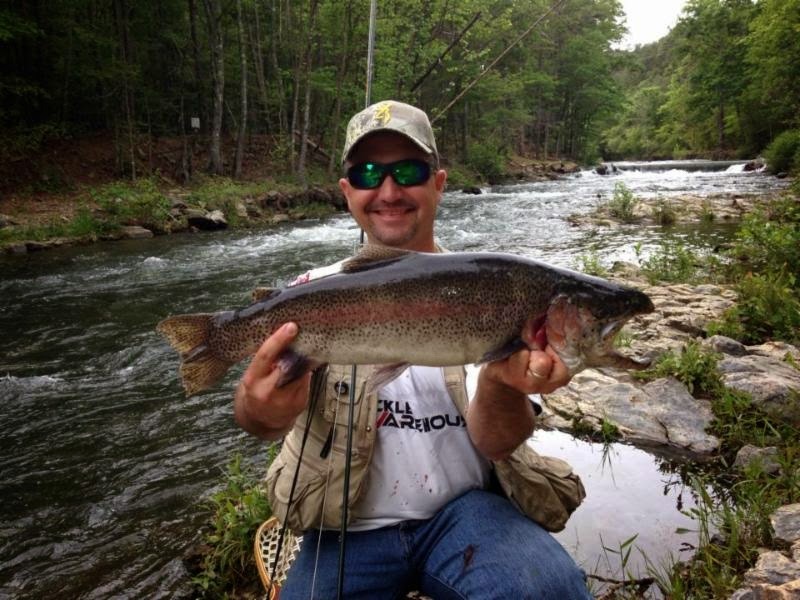 The Mountain Fork River in Beaver's Bend State Park below the dam of Lake Broken Bow offers year round trout fishing, and the winter months are considered the finest when it comes to hooking a nice rainbow or a big brown. 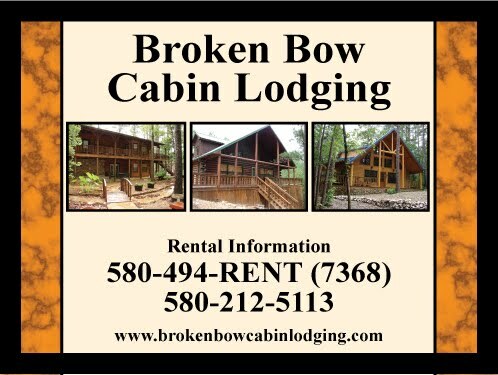 And if you are planning your fly fishing trip, the folks at Broken Bow Cabin Lodging are offering a Winter Trout Fishing Special called the "January & February 2011 Double or Nothing". You can stay stay 4 nights and pay the rate for 3 nights during both months. Come fishing in January and February and receive this special both months! They advise that you make your reservation now for the best selection from their inventory of beautiful cabins. 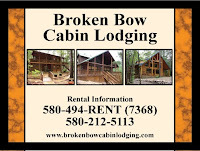 Visit their site at Broken Bow Cabin Lodging. Excludes Northwind Lodge, Holiday Weekends, January 14 & 15, February 18 & 19. 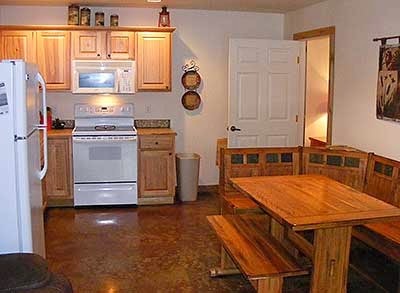 Snug Harbor Cabins on Lake Eufaula offers some of the nicest log cabin lake lodging in all of Oklahoma. The cabins are right on the water and you can enjoy all the comforts of home with a sunset view. I found the cabins so nice, I wanted to stay for a month!! There's also a convenience store (with a pool table), boat ramp, dock, and fire pits. Snug Harbor Cabins offers lodging discounts both on and off season. Print this post and take it with you for a 10% cabin discount during the off-season or a 5% cabin discount during the regular season. I'll see you there this March for the crappie run!! 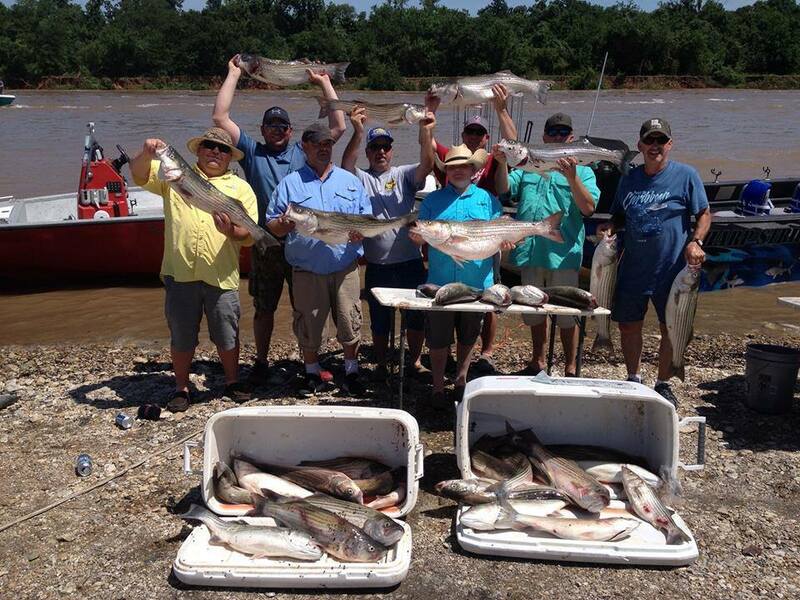 Check out Lake Eufaula fishing guide Dusty Keener and friends hauling in big slabs! If you would like to go fishing with D and K Guide Service, call 918-470-7133 or 918-470-6422. Check out their website at www.dandkguideservice.com. Congratulations to Southeast Oklahoma Fishing Guide Bodee Haltom for winning the 2010 Angler of the Year Award as presented by the Tri-Lakes Bass Club. It seems that Bodee loves fishing so much that when he’s not working at fishing, he's out fishing for fun! This was Bodee's first year of membership in the club and he went straight to the top!! He really knows his fish and lakes. 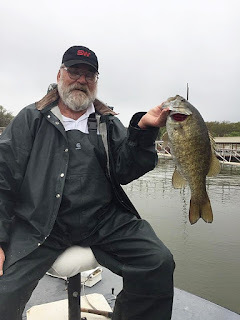 If you would like to go fishing with Bodee on Lake Broken Bow, Lake Pine Creek, Lake Hugo, or Lake McGee Creek, call him at 580-306-3921 or 580-584-3921, or to visit his website, click here. All of these lakes are an easy & beautiful drive from Dallas, OKC, Tulsa, Shreveport, Fort Worth, and Fort Smith.